Ten Speed Press, 9781607747017, 288pp. 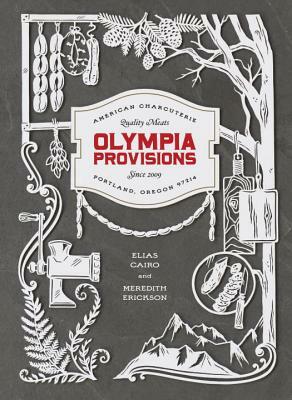 ELIAS CAIRO is a co-owner and the lead salumist at Portland, Oregon’s, Olympia Provisions, which he founded in 2009. Born in Salt Lake City to a Greek family who butchered lamb and goats utilizing Old World preparations and technique, Cairo started cooking at a young age in his father’s restaurants. He began a European apprenticeship in Switzerland at the age of twenty, where he learned classic butchery and charcuterie from renowned chef Annegret Schlumpf before moving to Portland to open Olympia Provisions. MEREDITH ERICKSON has written for the New York Times, Elle, the National Post, Monocle, and Lucky Peach. She has also worked as an editor and production manager for various magazines, campaigns, and television programs, and was the editor of The Family Meal by Ferran Adria. She is co-author with David McMillan and Frédéric Morin of the James Beard–nominated book The Art of Living According to Joe Beef, as well as Le Pigeon with Gabriel Rucker. She lives in London.